On Sept. 12, over 20 service agencies crowded S Building lobby with tables where representatives from service agencies in search of volunteers offered opportunities to those interested. Brookhaven College’s Service Learning hosted the Service Agency Fair, where students got the opportunity to explore and interact with service agencies, such as Total Hospice and Palliative Care, Heart House and the American Red Cross. “I didn’t realize there were this many volunteering opportunities,” Blessy Babu, a student, said. 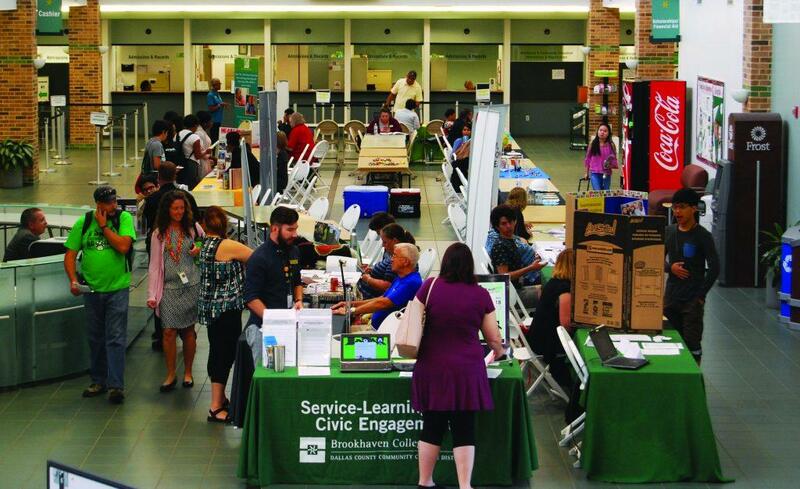 The Service Agency Fair’s goal is to aid Brookhaven students taking Service Learning courses to decide which agencies they want to volunteer with and encourage other students to help, according to the Brookhaven College website. Throughout the fair, agencies provided Brookhaven students, staff and faculty with an insight on the kind of volunteer work each agency does and provided applications for students to sign up. Some agencies offered students ways to volunteer on campus or in local communities, such as Good NeighBear and Conversation Partners. Amy King, a nursing student, said Service Learning hours are a requirement for the nursing program, but it has been difficult for her to find time to volunteer since the school semester began. Another agency that provides volunteer work on campus is Conversation Partners, which is in need of volunteers to help English for speakers of other languages, or ESOL, students practice speaking English outside the classroom. Pamela Jensen, an ESOL adjunct faculty member, said, “We need more than 30 volunteers – we currently have five.” Jensen said they have lost half of their volunteers after the Dallas County Community College District administration implemented a rule that every authorized volunteer must pass a criminal history background check. The rule became effective Aug. 1, 2000, according to dcccd.edu. Nathan Agre, a student, said he was interested in volunteering for Conversation Partners again due to his experience from the spring semester. “I try to volunteer at least four hours a week,” Agre said. King said the volunteer agency she was most interested in was Total Hospice & Palliative Care. Tara Nguyen, a representative for Total Hospice & Palliative Care, said their team consists of local medical professionals who provide quality hospice care for patients. The agency is seeking volunteers to provide companionship, read to patients and maintain their lawns, among other activities. Erika Dzangare is a community relationships manager for Heart House. Heart House is an after-school program that provides education and safety to underprivileged children and child refugees. “One of the things that really make us stand out is the heart component of our program,” Dzangare said. 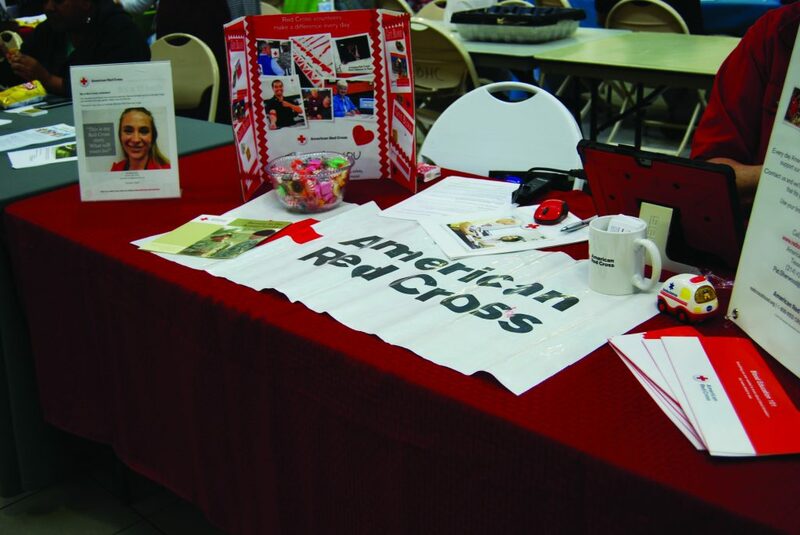 The American Red Cross table at the Service Agency Fair features information about volunteering with the organization. The American Red Cross website states it provides disaster relief, lifesaving blood, training safety courses, international services and aid to military families. Patricia Sherwood, volunteer coordinator for the American Red Cross, said she works with blood services. “Blood is needed 24/7. … The American Red Cross provides 40 percent of America’s blood supply,” Sherwood said. “I believe society needs more volunteers. I love to see young students get involved because it gives them purpose in life. There [are] so many different ways people can volunteer,” Sherwood said. This entry was posted in Campus News by Managing Editor. Bookmark the permalink.